Este artigo é sobre the thieves found in towns. Para other uses, veja Thief. 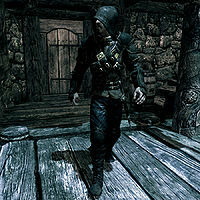 This Thief is a Nord bandit who can be randomly encountered after completing A Chance Arrangement. He can be hard to find, as he has a 20% chance of appearing, and only shows up in Riften or Riverwood. You must arrive between 10pm and 4am. Your level must be 5 or above. He will sneak around in the streets and, unsuccessfully, attempt to break into the stores. At other times, he may wander around acting innocently, especially if citizens pass by. If you try and approach him he will just reject you and continue his suspicious behavior. If you encounter him in Riverwood he will try and break into Riverwood Trader; if you encounter him in Riften he will be inside a random house. He wields a leveled dagger of the best possible quality and wears a standard set of Thieves Guild armor with matching boots, gloves and a hood. He carries a variety of random loot, a leveled amount of gold and five lockpicks. Esta página foi modificada pela última vez à(s) 16h30min de 15 de agosto de 2014.